Man, nobody ever remembers this card, I guess. I don't put it in decks, but I do love to get one out of a piloted shredder. 4 health is a good start for when you're up on board but behind on health. But it's 2 mana vs 5 mana. You could drop this turn 7 with a sludge belcher to make it survive longer. And now you made it 5 mana vs 7 mana. you kidding ? This is much more cheaper! It is like a strong Holy Light (or whatever it is called, sorry). 2 less on the "initial" (end turn) heal. But, you get a 0/3 buffable minion. It continues to heal as it stays alive, usually resulting in 8 healing total I 'd guess. Plus more with the 3 health minion. Cool, I wanted a way for shaman to get some self healing.. not sure this is what I wanted.. but it will do. Least there is some more totem synergy. I'm very happy if priest chooses to steal this over a more valuable nerubian egg, flame tongue or mana tide totem. you seriously think Cabal'ing this will mean the Shaman has lost? I love this card, but one question: how much is this better than Lightwell? i think lightwell synergices better, but does less healing and random, if your hero is 2 hp and you have a minion damaged by one, lightwell might heal that minion, which wouldnt be the best scenario. May I ask why some people say its a 7HP heal? 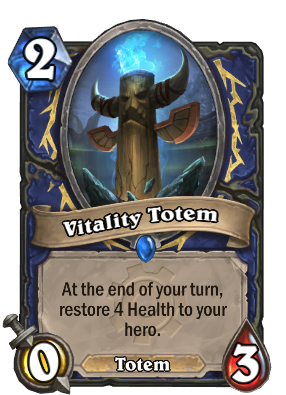 because it heals you for 4 and the totem itself has 3.
it heals for 4 at end of turn guaranteed. then the opponent will be compelled to kill it, so it will soak up at least 3 damage that would have otherwise hit you in the face, effectively acting as +3 heal. It can get silenced in which case it is only 4 heal, but this is actually better because it eats a silence and leaves a body on the board to be buffed by flametongue totem. Ah I see, thank you both.